In our opinions, we believe there’s nothing better than packing our outfits ready for strolls along the beach. This Striped Twist Front Shift Dress from Miss Selfridge is just £32.00 and adds a gorgeous bright stripe fabric to brighten up your holiday wardrobe. With a 60’s style mini length that adds a young, fun feel to the outfit, the high neck also adds to a sophisticated vibe to elongate the body. Try pairing with delicate sandals for a relaxed, beachy vibe that compliments sun-kissed skin tones. Effortlessly stylish with a hint of glam, the Leather Two Band Slingback Sandals from Next are just £22 and will keep you looking stylish from top to toe. Coming in gold and black, these buckle up beauties are perfect to add some glamour to your poolside outfit. 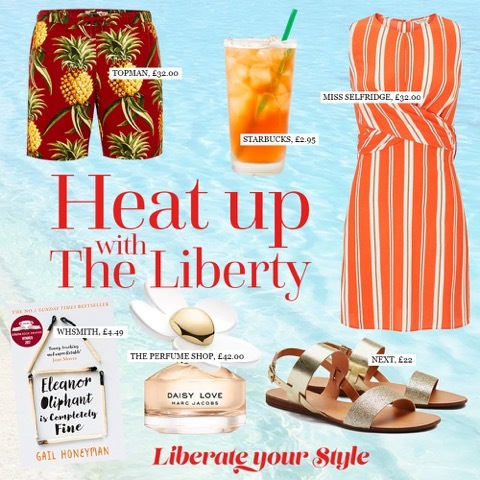 There’s nothing better than relaxing by a pool with a good book that you can’t put down so we’re picking up our copies of Eleanor Oliphant is Completely Fine by Gail Honeyman from WH Smith for just £4.49. As Honeyman’s debut bestseller and Costa’s First Novel Book Award Winner 2017, the light-hearted page turner has not only scooped The Sunday Times bestseller, it is soon to be a major motion picture produced by Reese Witherspoon. We can’t wait! If you’re looking to make a statement, Topman’s Red Pineapple Pull on Shorts are a bargain at just £32.00. With a slim fit and pull on style, the all over pineapple print screams fashion and confidence to make you shine. To really stand out, pair with a white shirt and your favourite trainers for casual comfort with a pop of colour. Holiday fragrances not only get you feeling fresh but help to link a scent to a whole host of special memories. Marc Jacobs’ Daisy Love can be found in The Perfume Shop at just £42 and, with notes of Cloudberries, Daisy Tree Petals and Cashmere Musk and Driftwood, the addictive and irresistible scent fills the air with a contagious love of life that’s perfect for holiday. If you’re rushed off your feet finding the last minute holiday bargains, why not pop into Starbucks to a refreshing Infused Iced Tea. In Peach Citrus, Pineapple and Strawberry flavours, there’s a little taste of summer for everyone at only £2.95 for a medium treat.